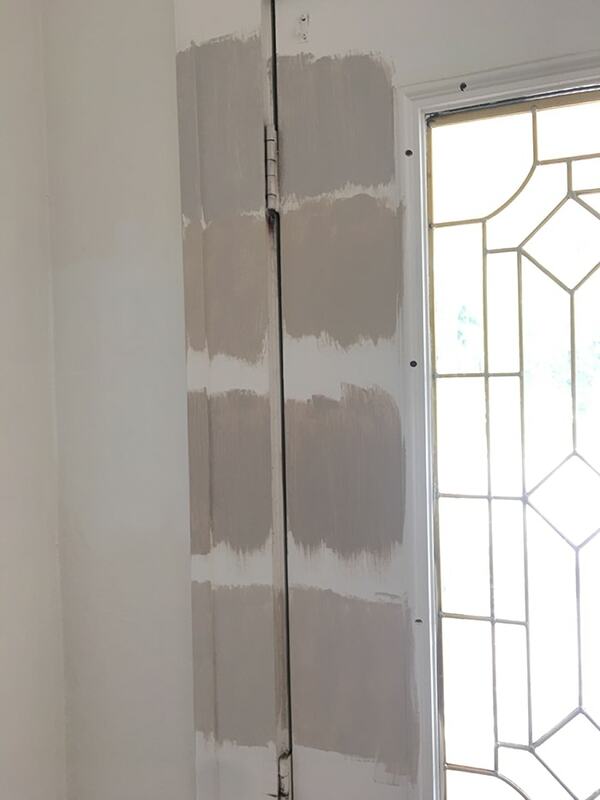 Stopping in for a quick (yet important) weekly update: We’ve chosen the paint colors & new flooring for the Riverside Retreat! Whenever I begin a project, paint and flooring always come first. These are the foundation of every design—the rooms’ canvas, if you will. They’re decisions that have to be made before you can choose décor and accessories—and they’re perhaps the most important, which is why I’m thrilled to be past this hurdle so we can move full steam ahead! All so different, right? 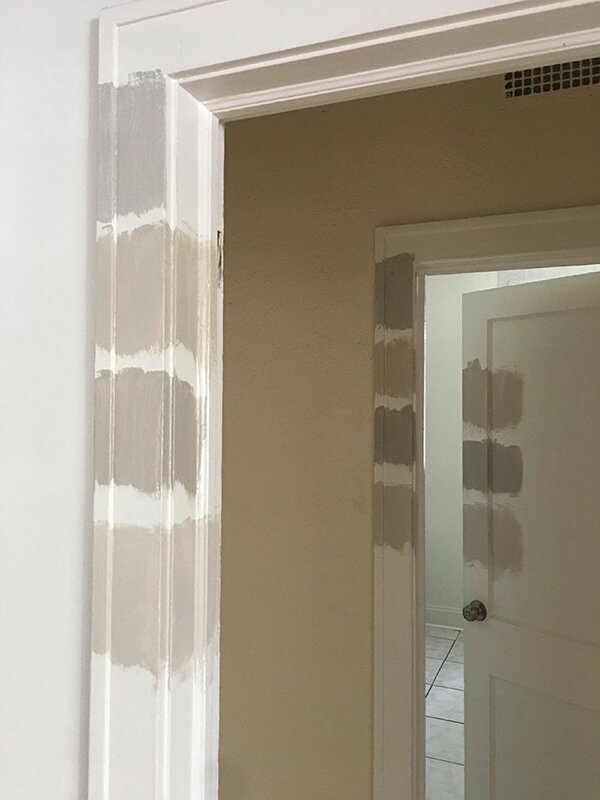 Promise me you’ll NEVER buy any paint without testing samples first. It has taken me years to finally convince myself of how necessary this step is, and if these photos don’t prove it, I’m not sure what will! 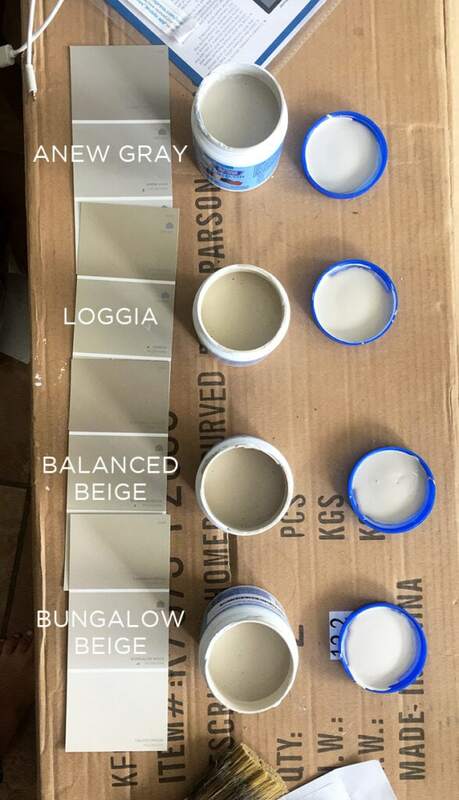 You’ve got to think of every paint color as a range of shades. There is no single ‘perfect color’—the swatch that you love on one wall in a room will look completely different just a few feet away in a shadow, or five hours later when the sun is at a different angle, or when a lamp is turned on. That’s why you need to get samples up on every wall and study them over the course of a day, with every possible combination of light. And from there, pick the one that works more often than the others. It’s a compromise. With that said, I went back and forth on Loggia and Bungalow Beige for a while, until deciding with certainty that Loggia was the winner. Perhaps the most exciting news from the weekend—we’re getting all new flooring! We decided to go for it now and get it out of the way. The current tile floors aren’t in great shape—apart from the fact that they’re not even matching throughout the house. They’re loose, cracked, grout missing and uneven transitions which make them a tripping hazard. So relieved for them to be gone! 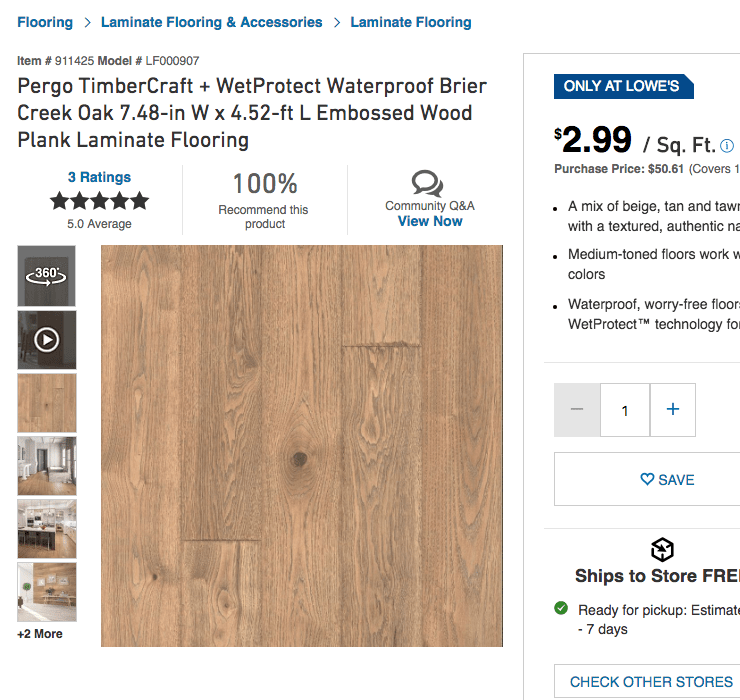 You may recall that this is actually the flooring I had chosen for our last home (the one that caught fire) so I figured I’d go ahead and use it now. Not sure if I’ll use it again for our new build, but at least this way I’ll be able to test it out first! I have used Pergo in a similar color (now discontinued) in the Cottage House and loved it, so it was an easy choice this time around. I’ll be sharing a lot more about the selection & install process next month once they’re in! 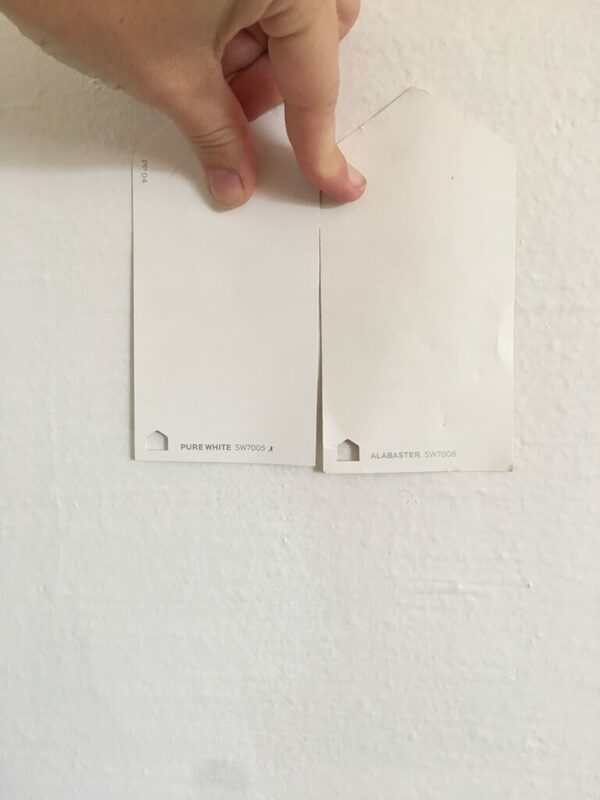 Here’s a sample next to the new trim color—you should always take your floor color into consideration when choosing paint! We’re laying the laminate in the whole house except for the bathroom. Unfortunately, the entire house is currently tiled and allllll of it (over 1600sf) will have to be removed before the floors can go down. We haven’t decided if we’re going to attempt to tackle it all ourselves or hire it out, but demo will begin this weekend. There’s a few dips and slanted floors in some of the rooms, so there’s also a decent chance we’ll need to repair some of the subfloor (hopefully not the floor joists). Follow along on my IG stories this weekend to watch the live demo action! 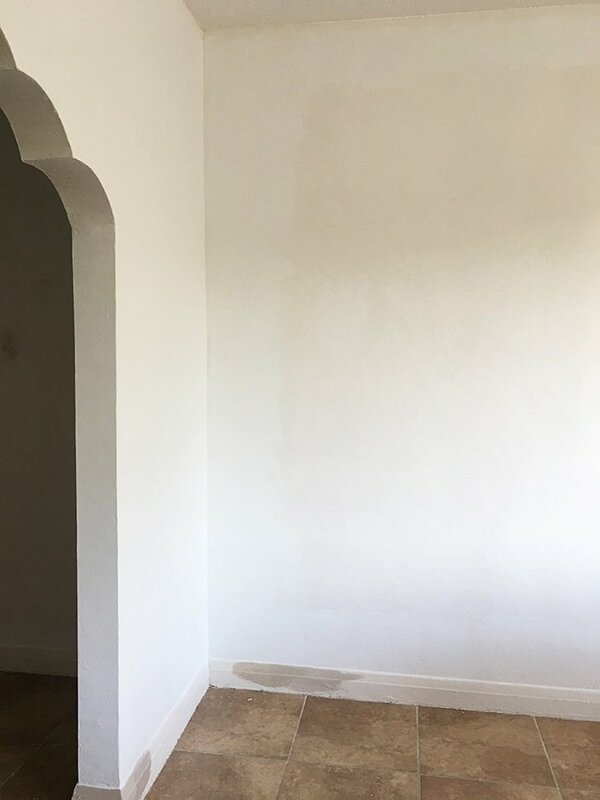 Within the next week we also plan to start adding crown molding in the living & dining room, along with some fancy molding accents on the dining room ceiling and a living room wall. There will also be a wall mural and painted ceiling involved—I haven’t done anything like this before so I’m looking forward to the results! In other house updates: no word on the new build permit, and we’re still going through the eviction process. And another update a few of you have been asking about—remember my Destination Design story? Well, Janice got a little surprise of her own—her husband was sent home from deployment early! It was too short of notice to finish the house (which is currently in the middle of construction projects) but he still got quite the surprise when walked in the door, and now we can breathe a little and not try to force an impossible timeline. Ideally, I’d still return to finish this month, but the to-do list somehow keeps growing and I’m not sure we’ll be able to squeeze everything in within the next few weeks. I’m doing my best to keep the ball rolling and hope to be able to share the Afters with you soon! I’ve used Loggia for all the trim in our little cabin, as well as the kitchen cabinets. It’s the perfect balance of grey and beige and not too dark. When did it get switched around? 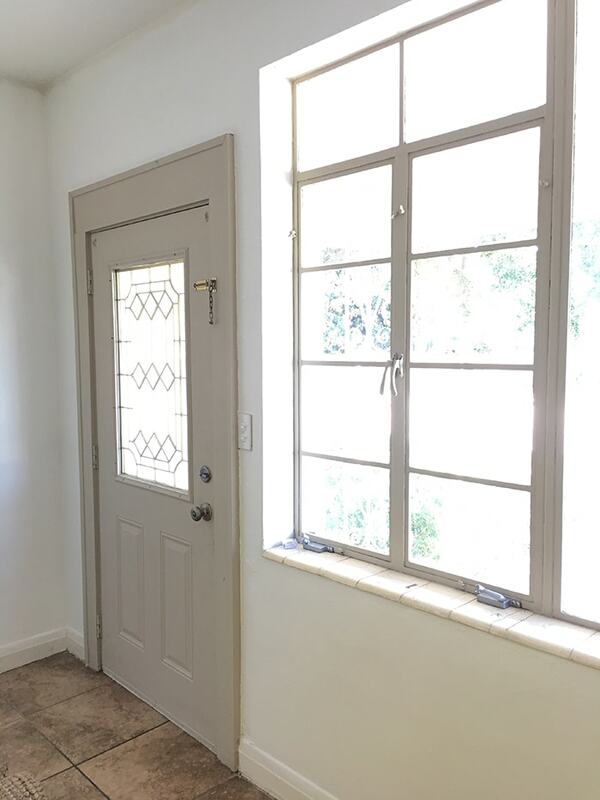 It used to be white trim colored walls, more and more you see colored trim and white walls. When did it change? It looks great so far, you have made a lot of progress already. Great paint tips too. Just a thought on removing your tile floors before you lay the Pergo. Eight years ago, we purchased a home with a large expanse of tile. We had Lowes install our Pergo flooring and they did it right over the tile! They’ve held up beautifully. 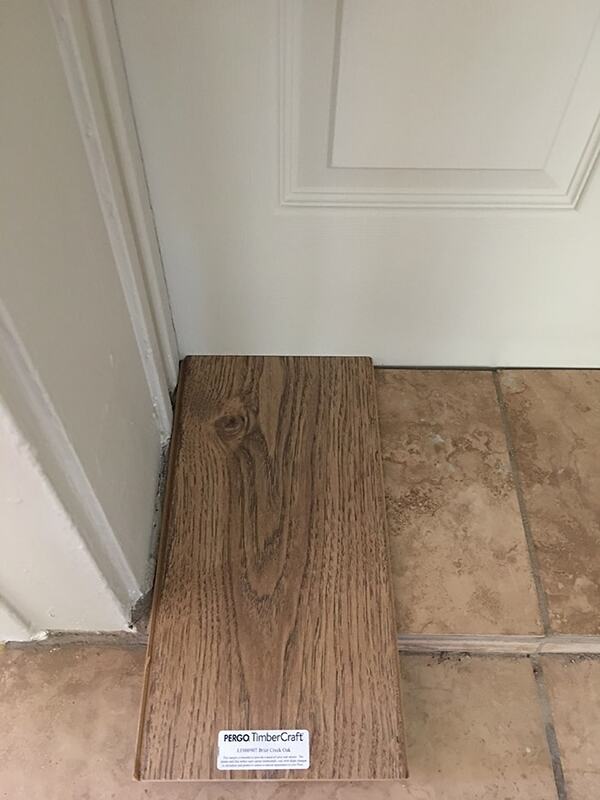 Check out this possible option before you demo those floors! I wish we could do that, but the tile is in such poor condition (loose, cracking, sloped floors etc) and it was pieced together over the years. Maybe there’s a chance we can salvage it downstairs, but at least most of it has to go! Agreed. If the tile is secure and level, you can install on top. It may present transition issues and eat up baseboard if your not replacing them. HI! Will you guys be building a custom home or did you choose from set floorplans? I’m building in Lee County (2hrs south of you) and I kept finding myself discouraged with builders and some odd floorplans! Thanks. Ah, thanks Lu — all fixed now! This makes my heart go pit-er-pat-er! I love your ideas and look forward to working with you! Pleeeease document the steps of tearing out the tile floor!!! I have considered doing it in my house and know it’s a huge job. I have not been able to find anything on youtube showing the actual tearing out; all I can seem to find is the “after’ shots. 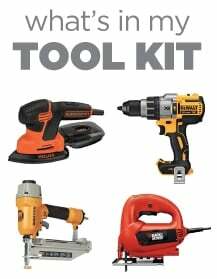 Are you using oil or latex paint for the trim and doors? Have you ever had problems getting latex to stick? Only latex, always! Never any problems using good quality paints. 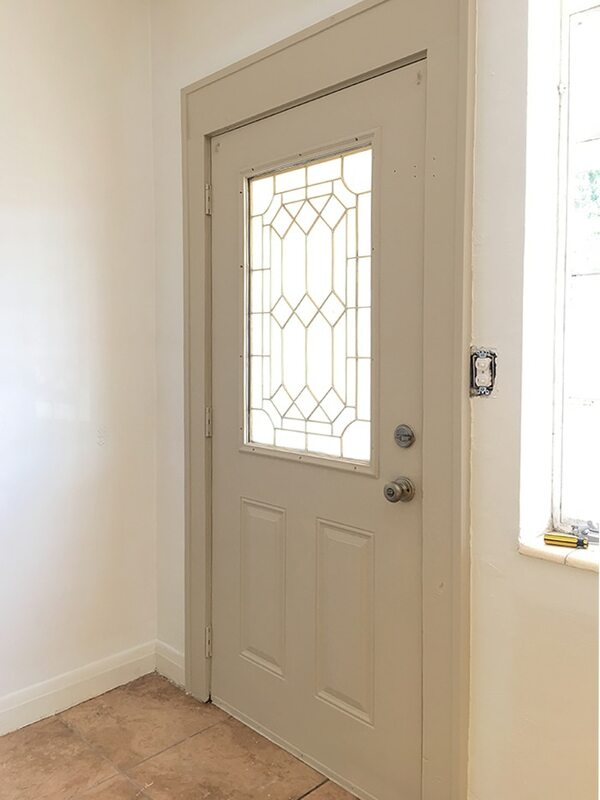 My brother and his fiance just painted their foyer bungalow beige and it looks SO GOOD!